This is the time when we experience some of the worst cold events. Today, I have received several phone calls and emails considering the thickness/weight of row covers, the combination of row-covers, double covering, and sprinkler systems. The predicted minimum AIR temperatures for Wednesday and Thursday morning will drop to the low 20s in wide regions of North Carolina (Figure 1). Please note that the AIR temperature is measured 6 feet above the ground, and the temperature at the plant can be even lower. 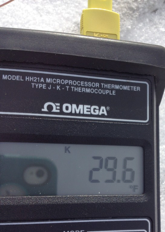 Those temperatures can cause damage, even with the use of row covers. After consulting with Dr. Barclay Poling, we both came to the conclusion that many might have to use sprinklers or double-covers, depending on your situation and the predicted temperatures. Figure 1: Predicted Minimum Temperatures For North Carolina Wednesday (3/5/19) and Thursday (3/6/19). Sprinklers on top of a medium weight cover (1.2-1.5 oz, Table 1) should be considered, if temperatures fall below 22-24 F. However, the effectiveness of a cover+sprinkler system cannot be assessed without measuring the temperatures directly at the plant level (Figure 2). It is important to note that it is virtually impossible to determine the actual temperature of the blossom without using a digital thermometer that is connected to a thermocouple wire that has the very end of the thermocouple inserted directly into the receptacle tissue of the open blossom. About 1/3-inch of the thermocouple wire’s Teflon coating must be peeled back so that the end of the thermocouple may be inserted in the blossom – the two wires should be twisted together (three to four twists) before inserting in the bloom. The relationship between air temperature and plant temperature is not constant, and under dry atmospheric conditions, the temperature of the bloom will be colder than the surrounding air. This instrument will eliminate the need to consult dew point temperatures (or wet bulb temperatures) for the purpose of estimating plant tissue temperatures. Make all of your start-up and shutdown decisions using the digital thermometer readings from at least several blossoms in the lowest part of the field. When atmospheric conditions are dry, it is a good precaution to start sprinkling on top of the row covers when the blossom temperature reaches 32 to 33°F. You should not see ice forming right away by starting at a blossom temperature of 32 to 33°F. It is better to waste some water than risk a lower start-up temperature that could produce a “cold jolt” at startup. 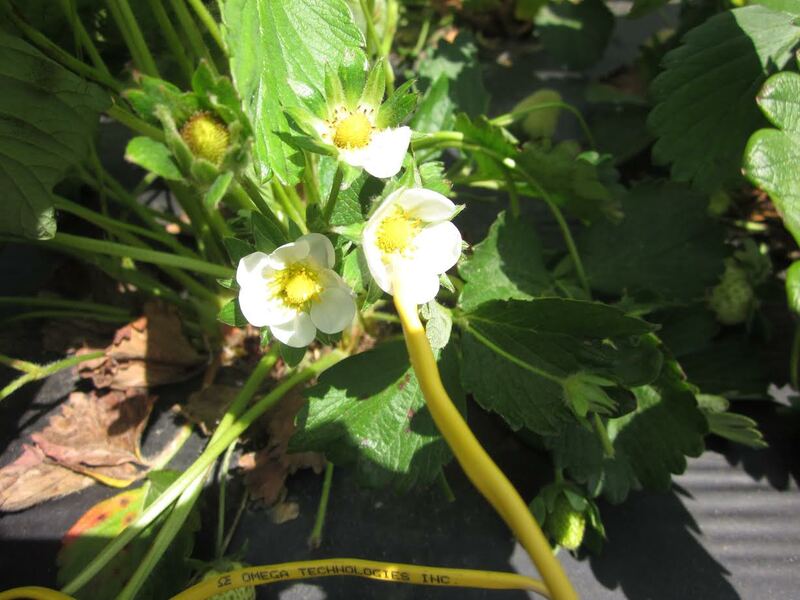 After you start sprinkling on top of the row covers, you will actually see from your digital thermometer that the bud and blossom temperatures immediately “pop up” (usually to about 38 degrees F). The reason the temperature actually rises this much is that there is a lot of ground heat. When water freezes, a beneficial release of heat occurs (called heat of fusion). As long as you can keep sprinklers turning, you will be able to maintain temperatures of the floral tissues above their critical temperature. In case of serious winds, you will definitely need extra labor to work with you at night to knock ice off nozzles—you want to keep nozzles rotating all night. The problem with nozzles freezing up occurs in frost/freeze and freeze events; it should not be a problem with a black frost event. In case your pump fails, the author has seen growers come through these situations successfully as long as they are able to get their sprinklers “going again” within 1.5 to 2 hours. Keep monitoring bud and blossom temps with your digital thermometer to know how critical the patient may become. Keep running the water on the frozen row cover past sunrise, and never stop running it until the blossoms in the coldest part of the field are registering 32°F. One of the reasons you need to have several blossoms for readings is that the thermocouple wire that was inserted into the blossom the previous day may slip out or lose good contact with the plant tissue. Often two medium covers may be able to give you protection into the high teens. Sometimes running water through the drip line can add some heat to the system as well.